This is my version of Feijoada which is the national dish of Brazil. 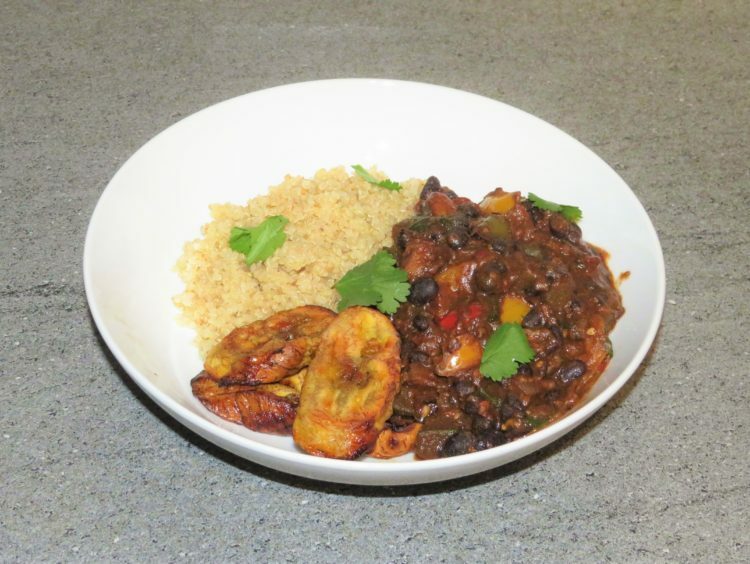 This meat free hearty black bean stew served with quinoa and plantain, will leave you feeling satisfied for hours. 1 Place the sweet potato on a large baking tray and sprinkle 1 tsp of cumin and 1 tbsp of coconut oil, then mix and toss it altogether. Put the red, yellow and green peppers on another baking tray and sprinkle 1 tsp of smoked paprika and ½ tbsp of coconut oil then toss and mix that together, then place both trays in a pre-heated oven on 200c/400f/gas 6 for 15 minutes until golden in colour. 3 Cook the quinoa per the packet instructions. 4 In a large heated saucepan on a medium heat add the 1½ tbsp of coconut oil, then add the onions, stir and cook for 3 minutes. 5 After 3 minutes add the garlic and stir. Then add the rest of the ground cumin and smoked paprika, plus the ground coriander, paprika, cracked black pepper and tomato puree. Stir and leave to cook for another 3–5 minutes. 6 Then add the okra and stirring occasionally, leave to cook for another 5 minutes. 7 When the sweet potato and peppers are cooked and lightly coloured remove from the oven and add them to the saucepan. 8 Add the black beans, add 200ml of water and stir turn up the heat high and bring to a rolling boil, then stir turn the heat down and allow to simmer for 10 minutes. 9 Meanwhile, place the plantain the oven and cook for 15 minutes or until it is lightly golden turning half way through. 10 After 10 minutes stir and add the chilli flakes to the saucepan and leave to cook for another 3 minutes. 11 Then add the chopped fresh coriander stir and cook for another 2 minutes, then stir and remove from the heat. 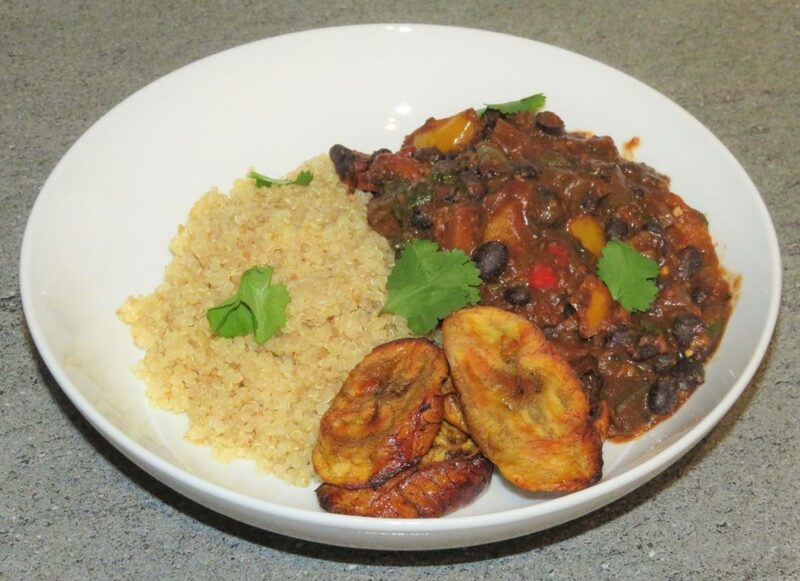 12 When the quinoa is cooked and plantain is golden remove from the heat, plate up and enjoy the taste of Brazil. Plantain is related to the banana but needs to be cooked. They have a higher amount of dietary fibre, vitamin-C, vitamin-A and potassium than a banana. 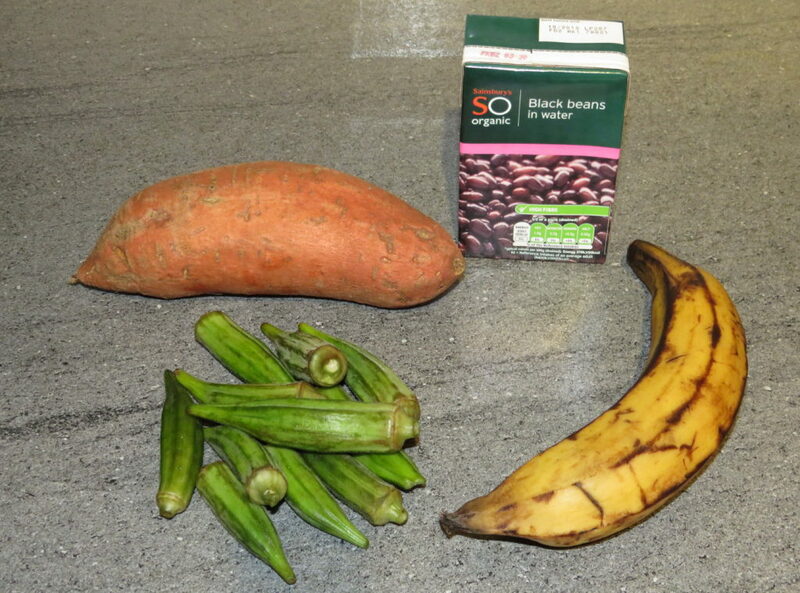 It is also rich in vitamin B-6, magnesium, phosphorous and iron. Okra are very low in calories, helps control cholesterol, aids weight loss, and contains high levels of dietary fibre. They have a health amounts of vitamin-A, vitamin-C, vitamin-K, vitamin B-6 and B-complex vitamins.